English (Translate this text in English): The Florida Keys island chain is the home of the only North America’s coral barrier reef. Coral formations are famous for their abundance of fish, from impressive schools of blue-striped grunts to toothy green moray eels. 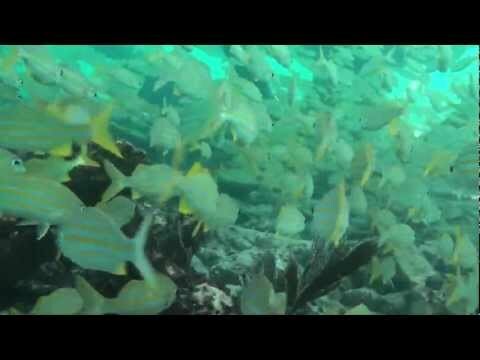 The U.S. government established the Florida Keys National Marine Sanctuary to protect the marine habitat. The Florida Keys island chain is the home of the only North America’s coral barrier reef. Coral formations are famous for their abundance of fish, from impressive schools of blue-striped grunts to toothy green moray eels. The U.S. government established the Florida Keys National Marine Sanctuary to protect the marine habitat. Fishy Story - MIAMI (Reuters) - A Florida diver shot a large grouper with a spear gun then apparently drowned when the fish sped into a hole, entangling the man in the line attached to the spear, investigators said Monday. The 42-year-old man, whose name was withheld, was free-diving in about 25 feet of water off the lower Florida Keys Saturday and speared a Goliath Grouper, Monroe County Sheriff's Detective Mark Coleman said. "It looks like the fish wrapped the line attached to the spear around the victim's wrist. The fish then went into a hole in a coral rock, effectively pinning the man to the bottom of the ocean," Coleman said in a news release. Police divers found the speared fish tightly wedged into the hole, with the man's body still tangled in the line, a sheriff's spokeswoman said. Goliath Grouper are the largest members of the sea bass family and can weigh hundreds of pounds.